The BCSD-CMIP5 data is found under the tab "Projections: Complete Archives". When I try to reproject rast1 using the other objects (rast2), the extent does not change and even though the reprojected rast1 is in the same crs, the extents don't line up. 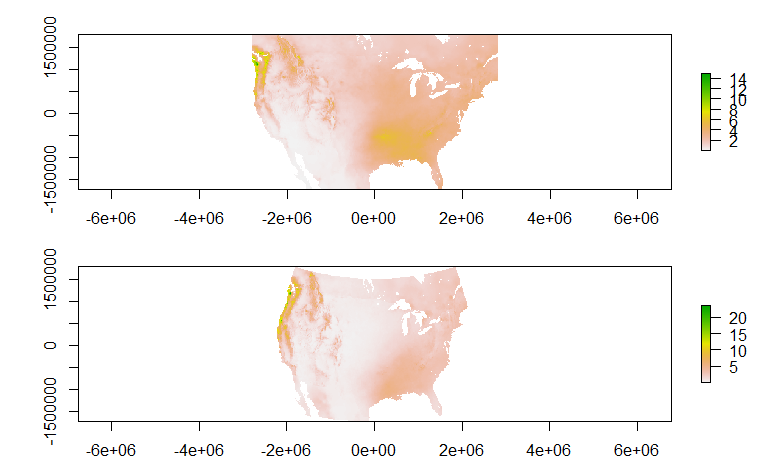 I have exported the two rasters and viewed in ArcGIS, to see if it was a plot() issue in R, but the images are the same as above, yet the projections are the same (according to ArcGIS 10.2). Even when I reproject the "bad" raster in ArcGIS, the projection does not appear to be in Albers Equal Area. When I import directly from the netCDF file into ArcGIS, the projection looks correct. It looks like the first image is using the WSG84 geodetic reference system, whereas the second image is using GRS80, which is why is looks curved. This suggests the objects haven't been converted to the same CRS. Can you provide the climate data, or a sample, so I or another user can look into this further? I posted at R-SIG-GEO and got this response from Dr. Hijmans. Not the answer you're looking for? Browse other questions tagged r coordinate-system or ask your own question. Units of specific CRS projection?